The first step is to export your contacts from Outlook. If you are not sure what version you use, you can open your Outlook and click on Help > About. Please follow the steps for either Outlook 2010 or Outlook 2007, then move to the instructions for importing the contacts. 3. Click Advanced. This opens the Outlook Options dialog box. 4. Under Export, click Export. 5. In the Import and Export Wizard, click Export to a file, and then click Next. 6. Under Create a file of type, click the "Comma Separated Values (Windows)" option, and then click Next. 7. Under Select folder to export from, select the contact folder that you want to export, and then click Next. 8. Under Save exported file as, click Browse, select a destination folder, and in the File name box, type a name for the file. 10. In the Export to a File dialog box, click Next. 2. Click on Import and Export. 3. From the list, choose Export to a file and then click Next. 4. From the list, choose Comma Separated Values (Windows) and click Next. A list of all of your folders will display. 5. Click on Contacts since we want to export Outlook contacts only. If you have created other contact folders inside the main contact folder, be sure to check off the Include subfolders box. 6. Click Next and then choose the location for your backup file. Make sure to browse to some other location, such as your Desktop, since Microsoft defaults to a hidden folder. Now that you have a .CSV file, you can import your contacts into Perpetua. 1. Open your .CSV file into a spreadsheet program, such as Microsoft Excel. 2. Highlight the email addresses (not including the header) and copy them to your clipboard. 3. Login to your website if you are not logged in already. 4. Click on Site Management. 5. Click on Contact Management. 6. Click on Import Contacts. 7. For the "Group to import into" option, you can either choose an existing group or choose "New Group" and enter a group name. 8. 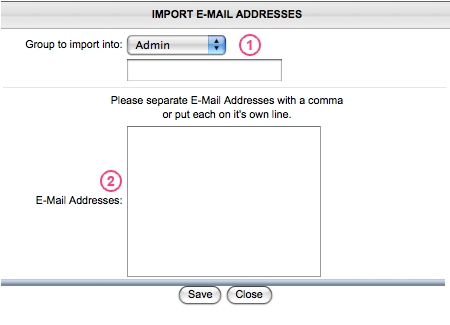 Paste the email addresses you copied earlier into the Email Addresses box. This should paste each email on it's own line. At that point, your email addresses should be imported! Feel free to open the contact group to verify that they are all listed.